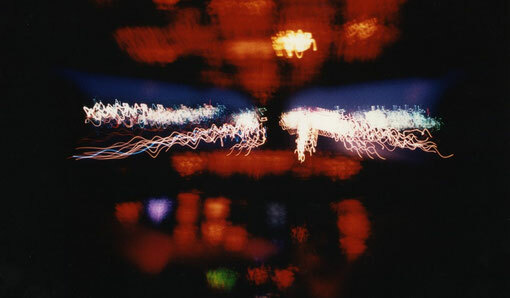 Wings - Website of mejstanley! 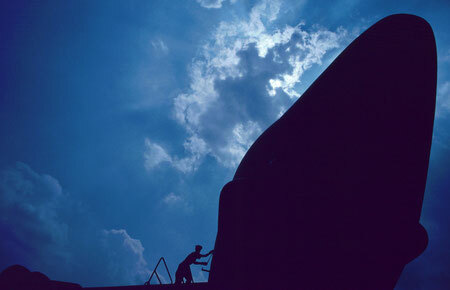 FROM 1985 ONWARD, military and security topics became an important part of my photojournalistic 'territory.' The Japanese government was beginning to loosen the political strictures that until that time had kept the Japanese Self-Defense Forces in what had been in many ways a less-than-ready posture to carry out their mission if the need had arisen. 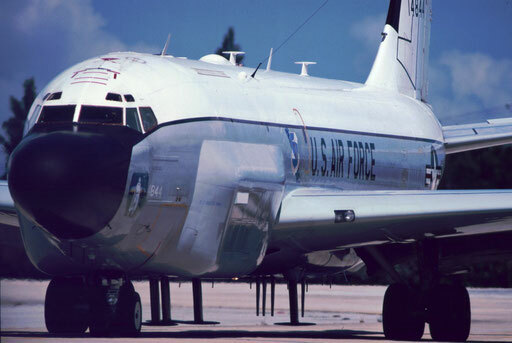 It was a period of great change as the Cold War moved toward its end. I had a front-row seat as I watched things unfold. 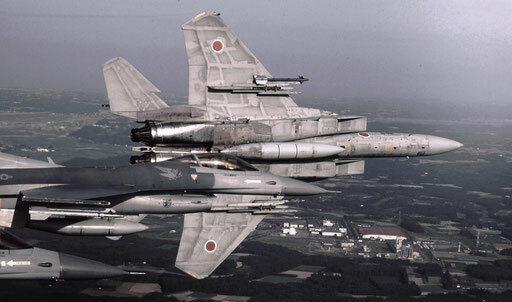 Most of the work I did centered on Fifth Air Force (the United States Air Force component of United States Forces, Japan) and the Japanese Air Self-Defense Force. 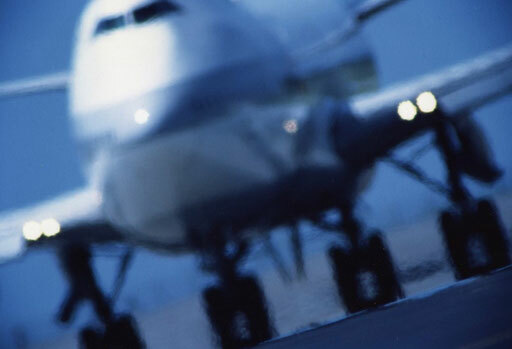 During the same period, I was often working with Japan Air Lines and so had numerous chances to glimpse the behind-the-scenes world of a first-class airline. 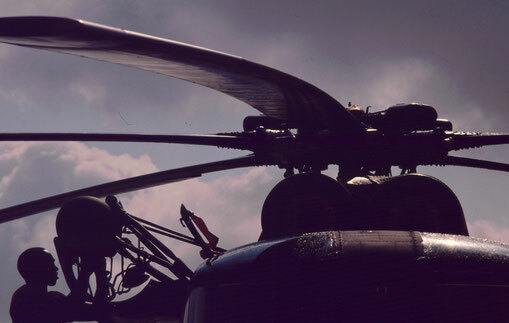 The military and civil aviation photography complemented each other, even though I would usually write the accompanying article texts for the former while the latter was more often photographic work shot to order for both internal and external corporate PR. 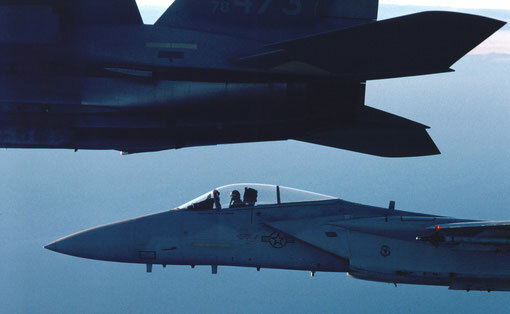 F-15s above the cloud deck; the East China Sea is 42,000 feet below. E-3 AWACS after an evening squall. 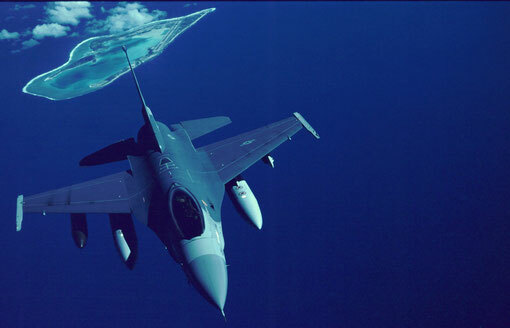 A Korea-bound F-16 passes over mid-Pacific Wake Island. 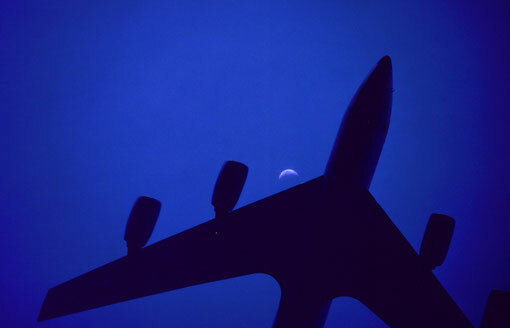 A silhouette in the tropic afterglow -- with a crescent moon above. 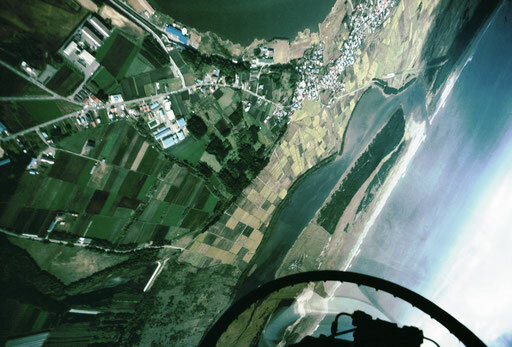 A JASDF cadet in a T-3 primary trainer does a loop over a coastal fishing town. 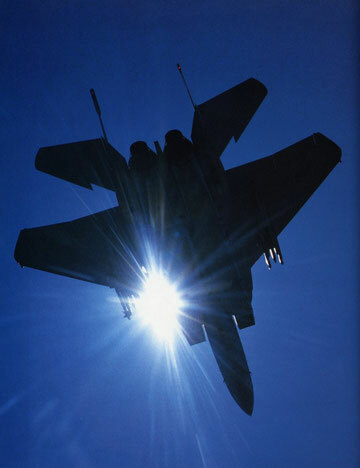 'Up close and personal' with a JASDF F-15. 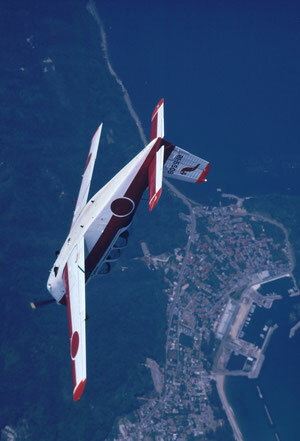 In September of 1986, I first qualified to fly in high-performance aircraft. 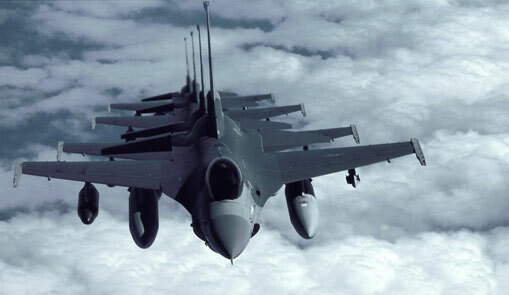 Photographing while flying in the back seat of the F-15 and F-16 was no simple task, especially as I was often in those back seats during full-on training missions and exercises; such flights were not 'photo orientation flights' for the sake of some nice images of the jets in a tidy and picturesque echelon formation such as we see in calendar photos or aviation enthusiasts' magazines. I am sure that in many cases when "fight's on!" 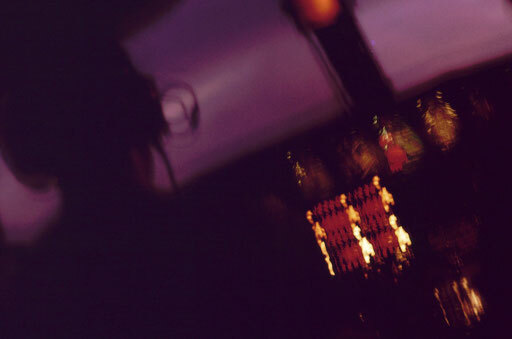 came over the radio, the pilots in front of me momentarily forgot that I was in the rear seat. 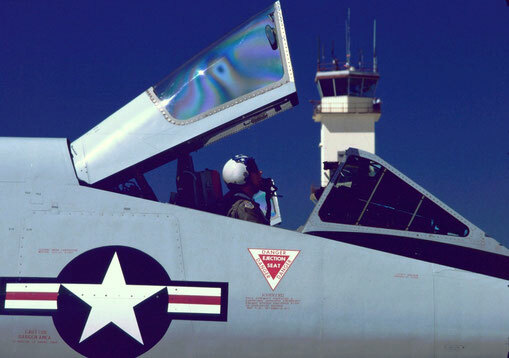 The G forces imposed by the jets' edge-of-the-envelope maneuvers combined with the basic physical constraints of the cockpits sometimes made even holding the camera in place a significant challenge. Because of the varying degrees of difficulty in keeping the viewfinder straight in front of my left eye (this due to G forces, relative position of the aircraft being photographed, interference from the helmet or oxygen mask, or the angle of my torso in the seat) at times I just had to sight over the top of the camera and use a TLAR ('That Looks About Right') technique that was gradually refined by experience. After a few disastrous early attempts, it actually came to work fairly well. 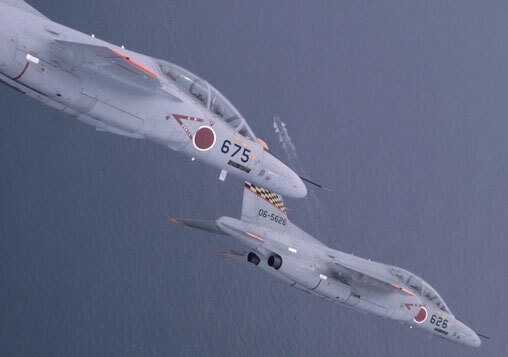 T-4 trainers make a knife-edge turn in tandem. Taxiway mirage at Naha International Airport. 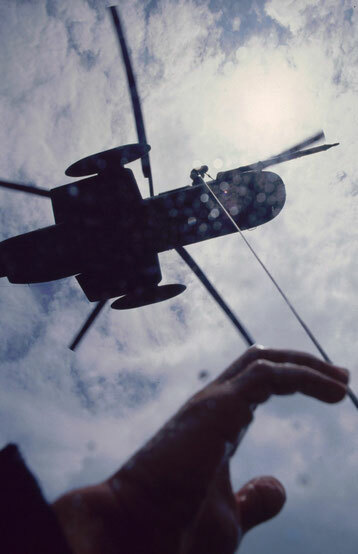 Combat Search and Rescue in action; looking straight down on a downed pilot and his rescuer about to be hoisted aboard the helicopter hovering above. 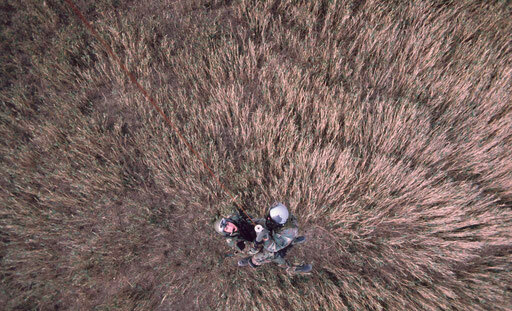 The tall grass around them is flattened by the rotor downwash. 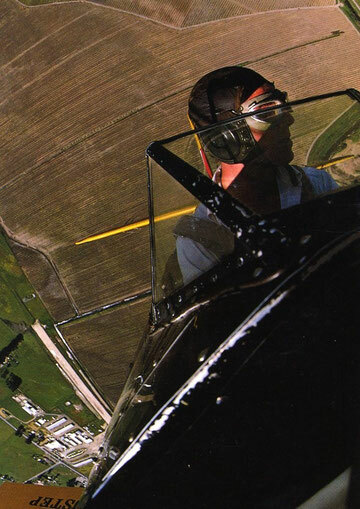 Doing a loop over California vineyards in a classic Stearman PT-17 biplane. 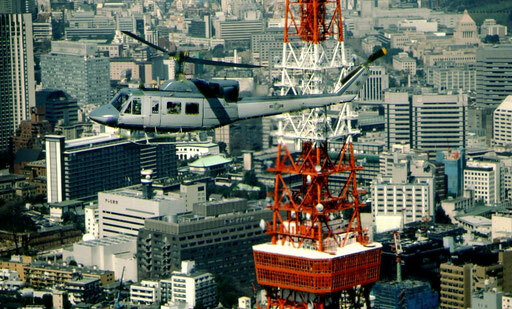 Carrying the commander of US Forces, Japan, a UH-1 from Yokota Air Base passes the red and white skeletal spire of Tokyo Tower. 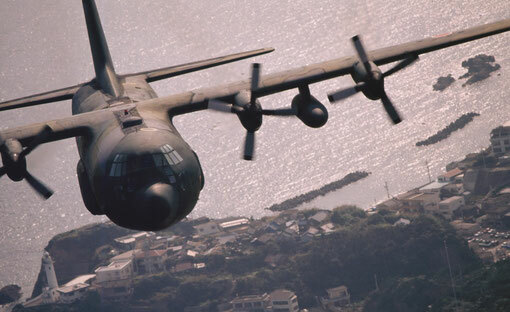 A Japan Air Self-Defense Force C-130 heading for its base at Komaki. 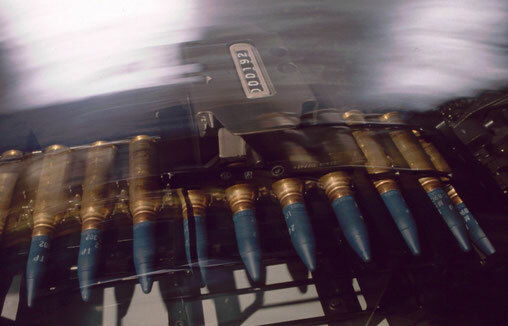 20mm aircraft cannon rounds pass through a counter. 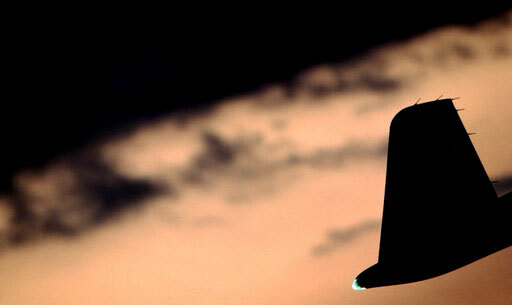 A JASDF pilot searches the sky for the 'enemy' in a Cope North air-to-air combat exercise. 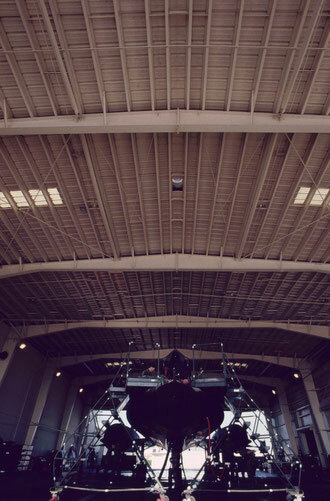 Morning maintenance on a search-and-rescue helicopter. Returning to base after a DACT (Dissimilar Air Combat Training) exercise with US Air Force F-16s (visible in the foreground), a JASDF F-15 stands on its wingtip as the pilot begins a 'break' into the downwind leg of the landing approach. 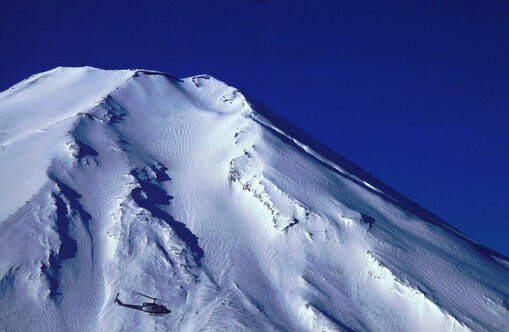 A UH-1 helicopter passes Mt Fuji on its way home to Yokota Air base, Japan. 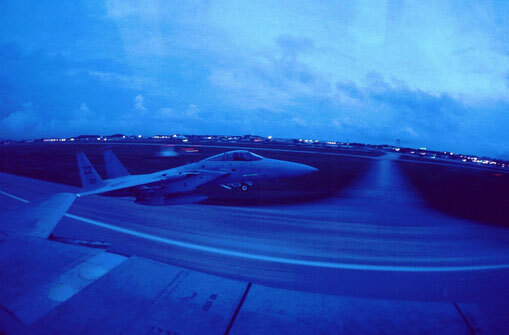 An evening takeoff at Kadena AB, Okinawa. 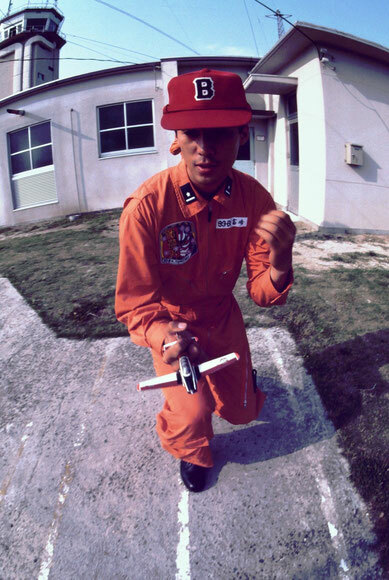 A JASDF pilot cadet concentrates with all his might as he runs through an 'image training' landing approach; Hofu-Kita Air Base, Japan. 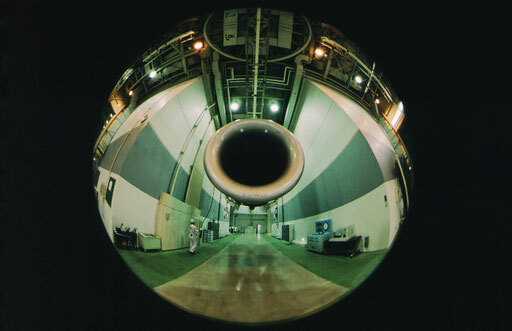 An indoor testing chamber for airliners' jet engines; Narita, Japan. 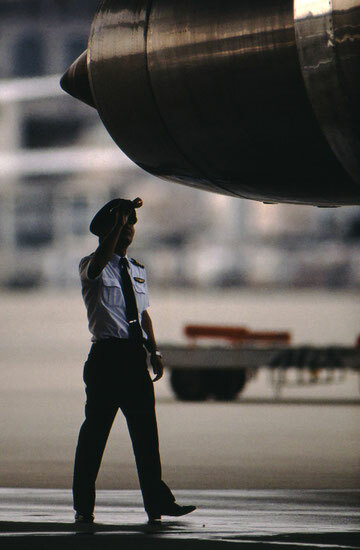 A Japan Air Lines pilot doing his preflight "walkaround" inspection; Narita, Japan. 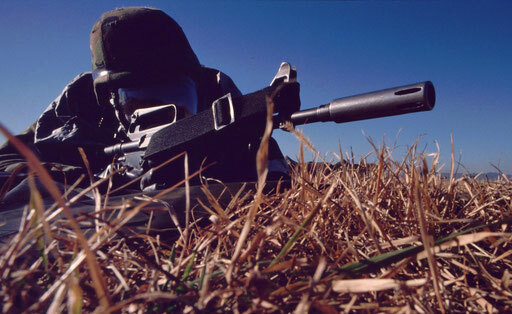 Training in air base defense tactics under conditions simulating an enemy special forces attack while the battlefield is exposed to chemical and biological munitions. Studded and swollen with grotesque antennas, "Ghost Rider" -- an RC-135 Rivet Joint electronic reconnaissance aircraft -- rolls out for takeoff. 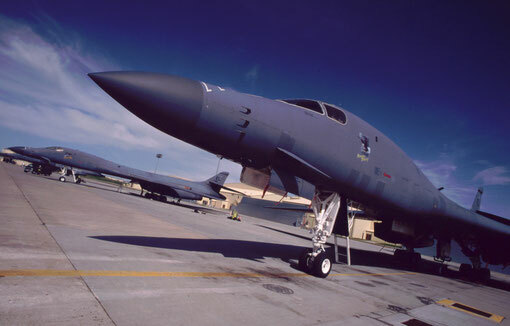 B-1Bs on the tarmac: Ellsworth AFB, South Dakota. 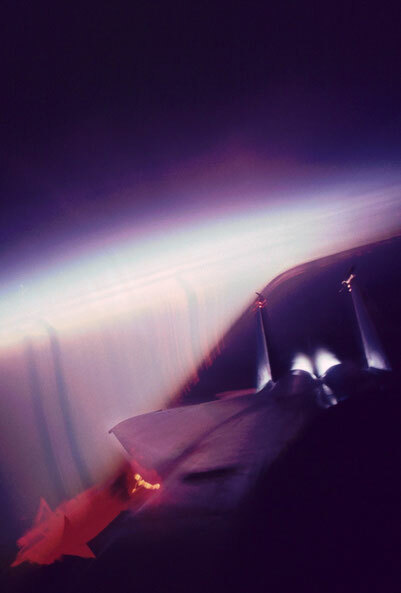 A hypersonic -- and supersecret at the time -- SR-71 being prepped for a mission. 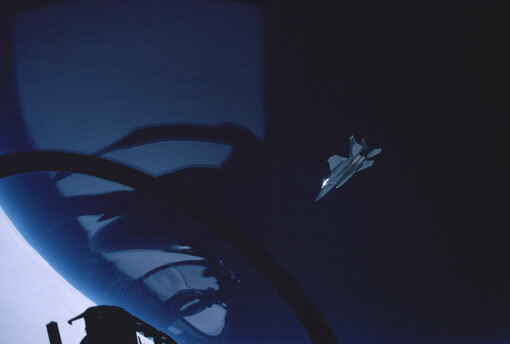 F-15s head earthward as they finish a loop. The first wave of helicopter-borne Marines prepares to move inland from the beach at Tok Sok Ri, South Korea, during a bilateral/joint Foal Eagle exercise. 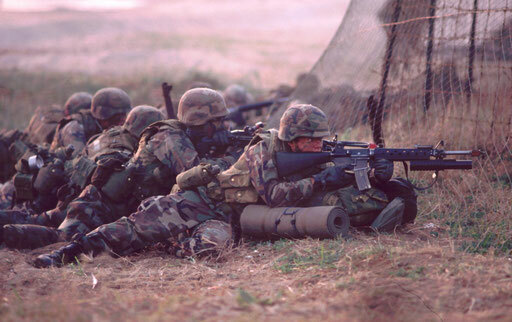 Their task is to take and hold the beachhead for the seaborne forces that will follow. 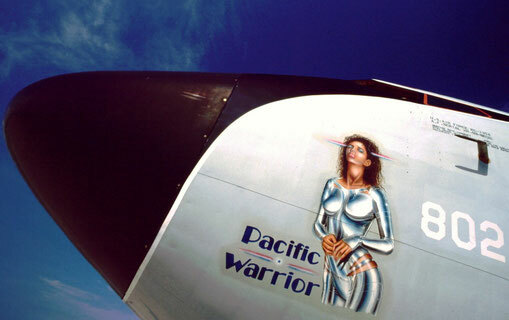 An American military aviation tradition: nose art. 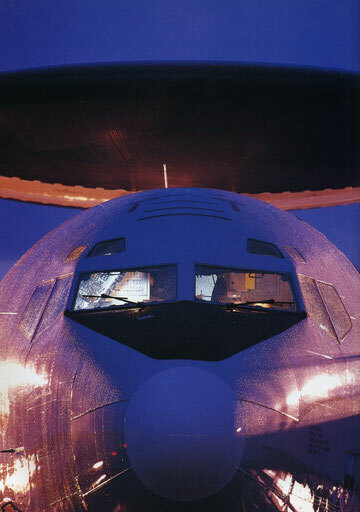 This example is on a KC-135 aerial tanker. 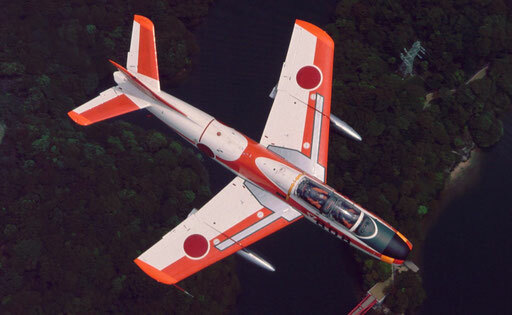 A JASDF T-1 jet trainer from above. Destination unknown: with a green burst of flame, No. 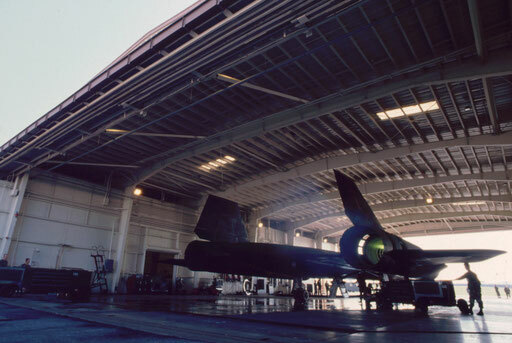 2 engine roars to life as this SR-71 prepares for its last operational reconnaissance mission from Kadena Air Base, Okinawa, Japan. 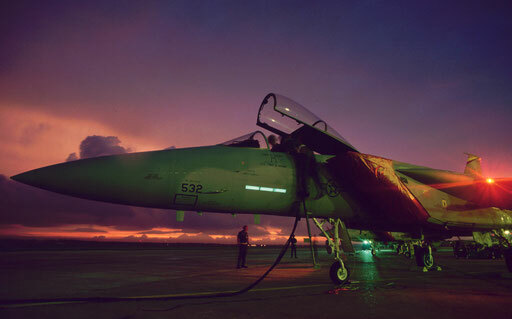 A US Navy F-14 takes on fuel over late-afternoon clouds. 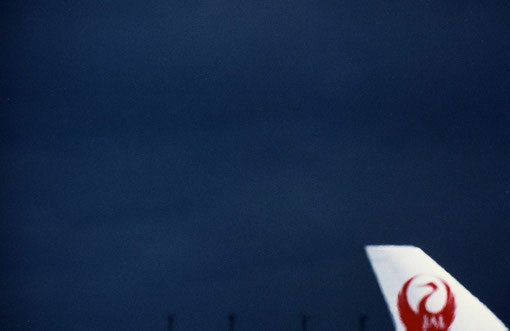 The wingtip winglet of a JAL B747. 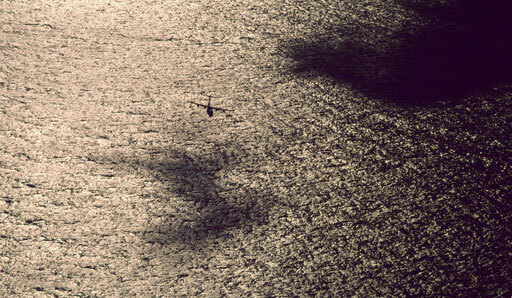 An angel of mercy with an 11-man crew: a Japan Maritime Self-Defense Force US-1 air-sea rescue flying boat swoops low over the sea. 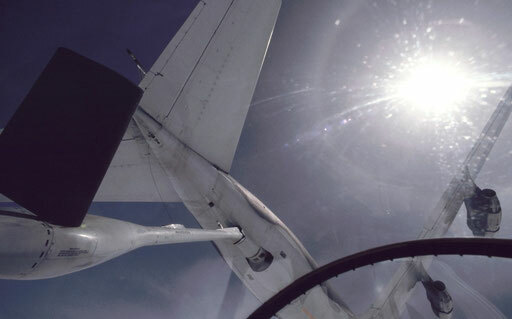 Looking almost straight up the boom connecting a refueling F-15 to the KC-135 aerial tanker above. As they return to Misawa Air Base in northern Japan, these F-16 pilots examine each other's aircraft to see if anything is loose or awry from the training mission's maneuvering. 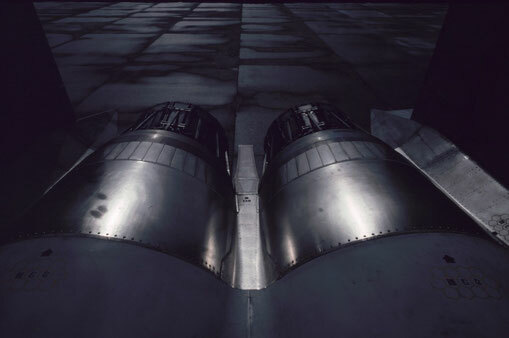 The twin exhaust nozzles of an F-15. The runway and instrument lights blur as a JAL B767 hastens to lift off from Fukuoka. 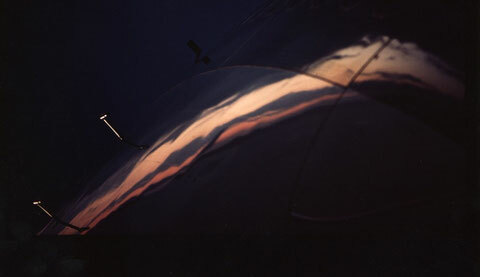 A thirsty S-3 subhunter takes fuel from a flying tanker. Rescue! This brings to mind the words of the Naval Hymn: "Oh hear us when we cry to Thee, for those in peril on the sea." 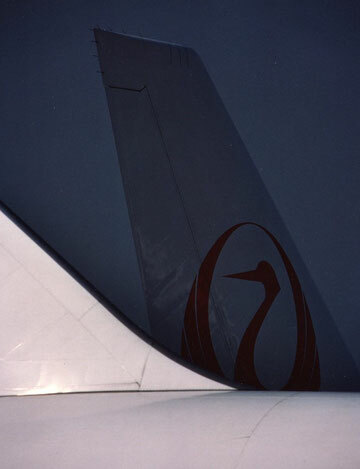 Pitot tubes on the side of a JAL B747. 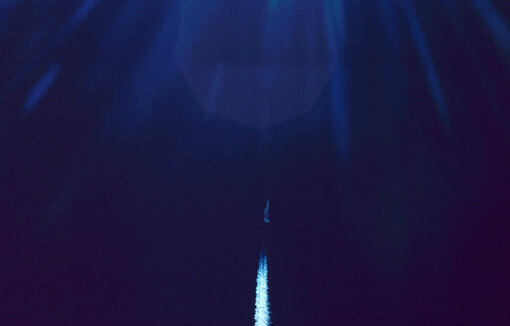 Going into an inverted dive, the sky is suddenly 'below' and the sea - with its boats and islands - is suddenly 'above'. 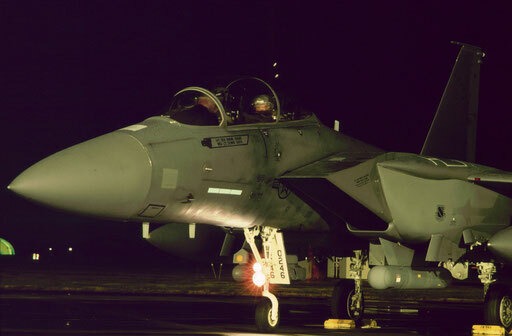 An Alaska-based F-15E Strike Eagle ready to taxi out for a night mission during a Cope North bilateral JASDF-USAF exercise. 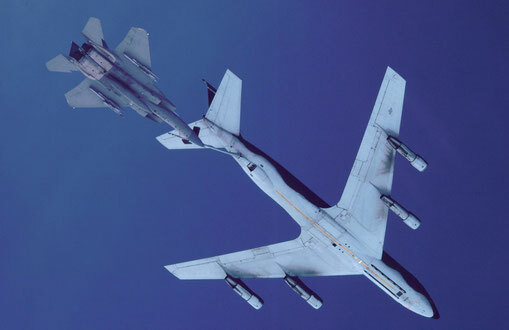 An F-15 approaches a KC-135 flying tanker to refuel. 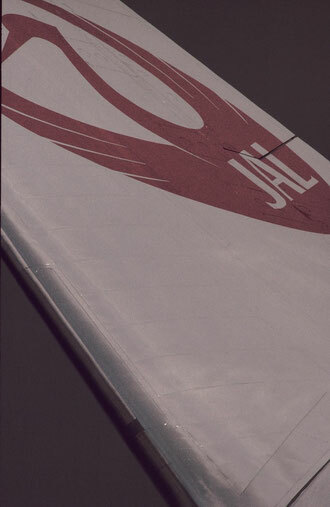 A B747 tailfin with JAL's familiar crest. 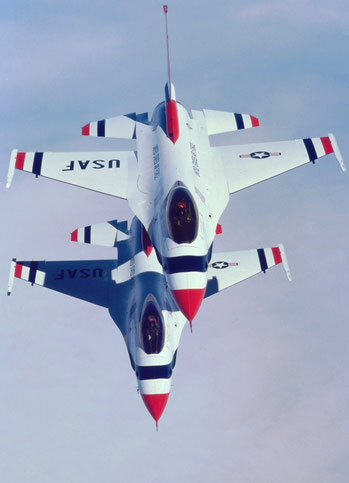 Two F-16s of the Thunderbirds -- the US Air Force's Aerial Demonstration Team -- hold tight formation for a photo on a flight across the Pacific. 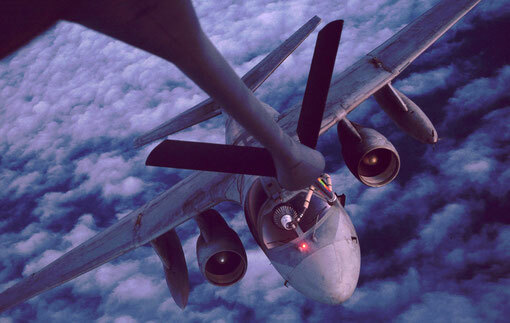 A B-52 crew chief is dwarfed by the massive nose of her charge. 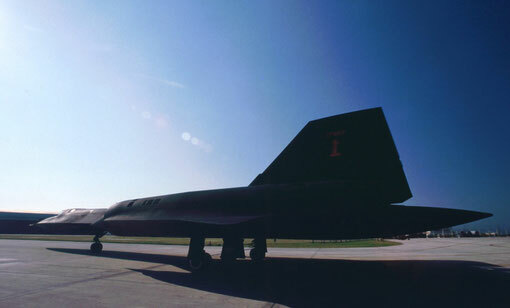 An SR-71 taxis to its takeoff runway. 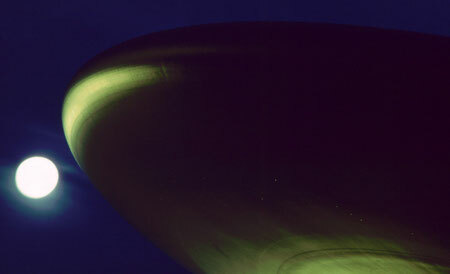 Not a UFO, but the rotodome of an E-3 AWACS aircraft against a rising full moon. 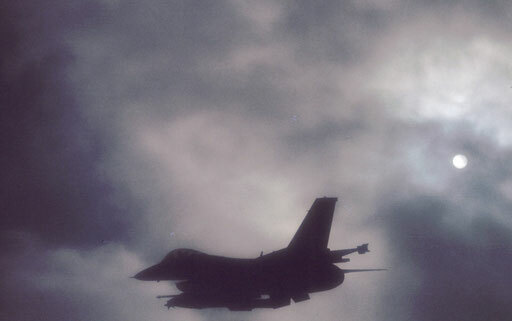 Silhouetted as it cuts through low late-afternoon clouds, a Misawa-based F-16 approaches the Ripsaw gunnery and bombing range for a low-level surface attack pass. Flying around the storm; above the wilderness of western Arnhem Land, Northern Territory, Australia. 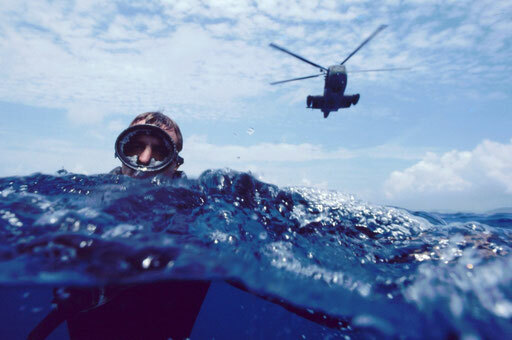 Pararescueman in the water; the rescue helicopter approaches slowly behind him. 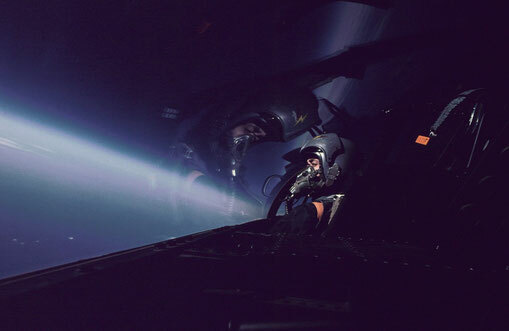 The pilot of an F-106 supersonic interceptor watches squadronmates climb high after takeoff. 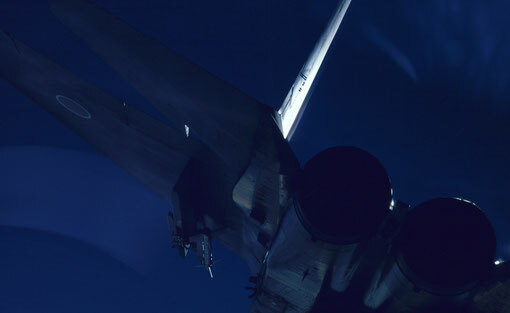 Looking straight aft in an F-15 high in the evening afterglow just as the pilot hits the afterburners while banking hard to the left. 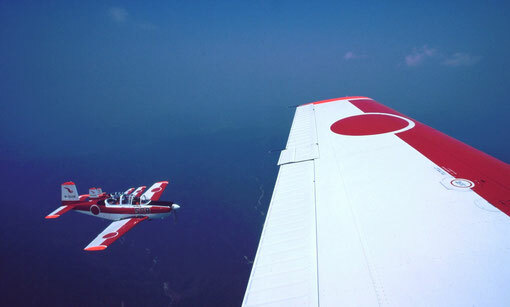 JASDF T-3 basic trainers in formation. 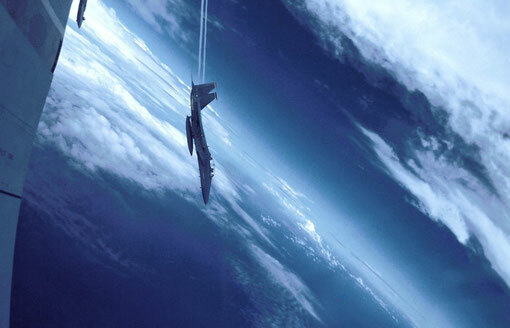 An F-15 accelerates going straight up. 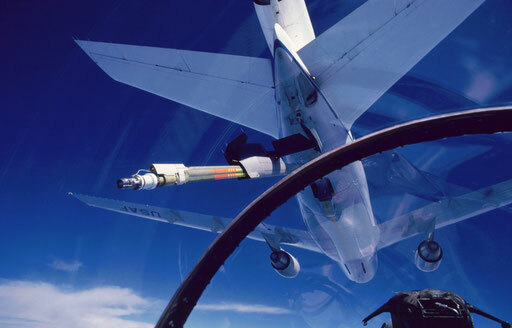 Approaching a KC-10 tanker to refuel, as seen from an F-15 cockpit. 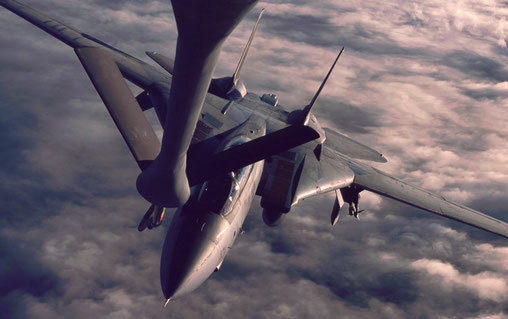 The refueling boom receptacle is just aft of the port wing root leading edge, hence the F-15 is slightly offset to the right of the KC-10's centerline. 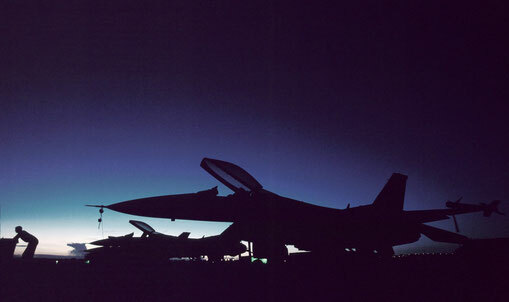 Four F-16s in a trail formation high above the Pacific. 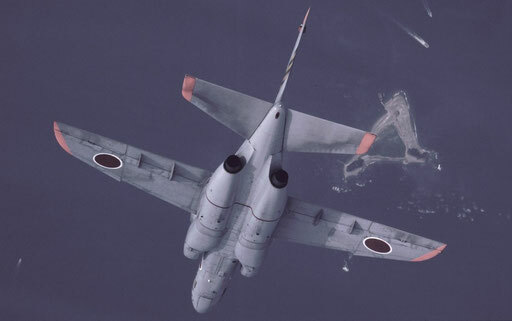 Tight formation en route to training area Whiskey-179, off Okinawa, Japan. Cabin crew trainees practice emergency evacuation from a ditched airliner. 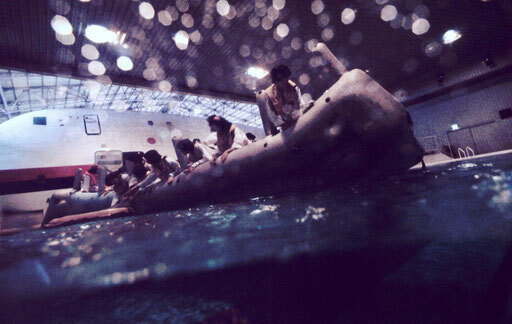 The poolside mockup fuselage is part of JAL's training facilities complex. 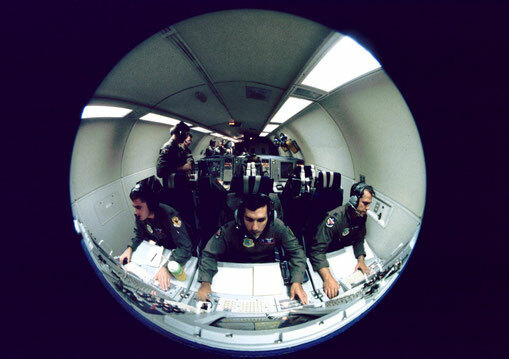 Inside an E-3 AWACS aircraft, radar controllers monitor fighters in an aerial battle. 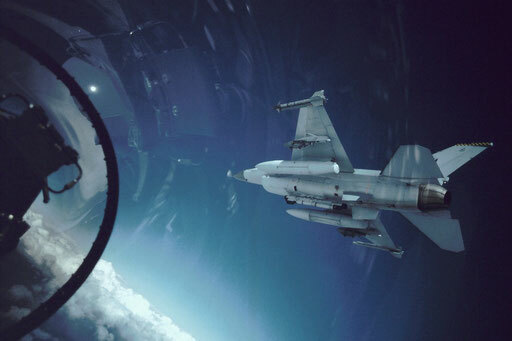 Seen from the cockpit, the world turns upside down as an F-16 bores in for a gunnery pass on the Ripsaw Range in northern Japan. The targets are the aligned whitish rectangles in the cleared swath visible just above the curved canopy bow. 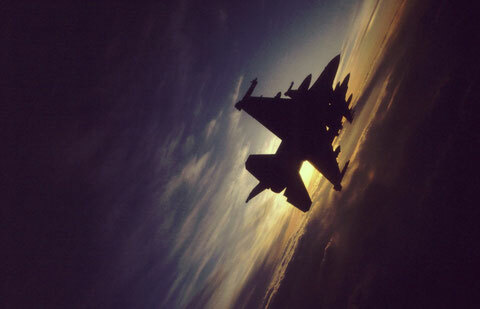 F-16s bank into the sunset over the Sea of Japan.